A conspiracy brews in Washington, D.C. and the one man trying to uncover it is dead. Now Hunter Davisson, a down-and- out ex-Navy SEAL who has been blamed for the murder, is trying to clear his name. Hunter soon begins to realize the situation is even bleaker and more dangerous than he thought. This isn't just a personal threat - he's encountered a conspiracy that threatens the very existence of the nation. A threat that comes from the most unexpected of sources - from inside the highest levels of the government itself. The Good Assassin could be ripped from today's headlines. Rod Gramer is a veteran journalist who has worked as a newspaper reporter and editor and television news executive in Idaho, Oregon and Florida. 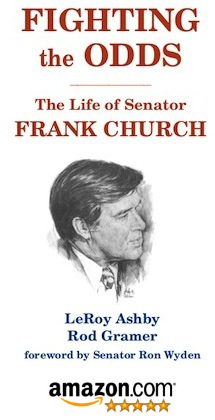 He is the co-author of Fighting the Odds: The Life of Senator Frank Church. Concerned about the rise of the national intelligence state in post-911 America, Gramer decided to tackle the tough question of balancing the nation's security against the constitutional rights that safeguard our liberties. In The Good Assassin he explores what could happen if the nation's most powerful intelligence agencies fall into the wrong hands. I started writing The Good Assassin in the fall of 2010 in Portland and finished the first draft by May of the following year. The last two years were spent revising, polishing and getting the novel ready for publication. 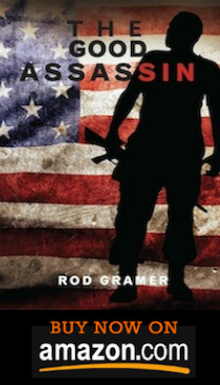 I had several working titles for the book: "Liberty Crossing," then "Patriot Day," and finally "The Good Assassin." The idea for the novel came to me after I submitted a short story about a troubled Iraqi war vet to an editor. He liked the story and suggested that it could be lengthened into a novel. I thought it was better suited as a short story and didn't have the legs to be a novel. But, as I was thinking about his proposal, the image of a vet living on the streets of Washington, D.C. came to me. Perhaps because in the 1980s my wife, Julie, and I lived in Washington and we were unnerved by the large number of homeless, including many vets, who were sleeping in doorways and over heating vents. It seemed sad to us that those men who had served their country were now living on the streets in the shadow of the U.S. Capitol. On any given night there are tens of thousands of Hunter Davissons living on the streets of America's cities. They need our help - before they give up hope. I am contributing part of the net proceeds of The Good Assassin to a program that is helping veterans who are returning from the wars in Iraq and Afghanistan. If you want to help, please donate to your own favorite non-profit that benefits our veterans. My own chosen program is the Wyakin Warrior Foundation. According to Native American legend, a wyakin is a guardian spirit - often in the form of an animal like a bear or eagle - that advises and protects a person throughout life. We can all become a "wyakin" for a vet by donating our time and money to programs that advise and protect these true American heroes. Order your copy of The Good Assassin today! REVIEW: "An exhaustive, nicely done biography of the late Idaho senator Frank Church, whose four terms (1957-81) ran from the beginning of the Cold War to the post-Vietnam era. A liberal Democrat who "resembled a rejuvenated New Dealer," Church represented an extremely conservative and Republican state. Ashby (History/Washington State Univ.) and journalist Gramer note that even though he developed considerable national clout, Church was always fighting for survival back home. Elected at age 32, he was one of the youngest senators in US history...a fine examination of the fate of New Deal liberalism, its role in the Cold War, and its failure to stand up to what the authors call the "growing power of the New Right." --Kirkus Associates, LP. All rights reserved.